I am a very avid cold-water scuba diver using my underwater experiences and photographs, in addition to the marine mammal engagers, in my education and conservation efforts. That this risk is simply too great to allow the marine transport of bitumen in the proposed area. 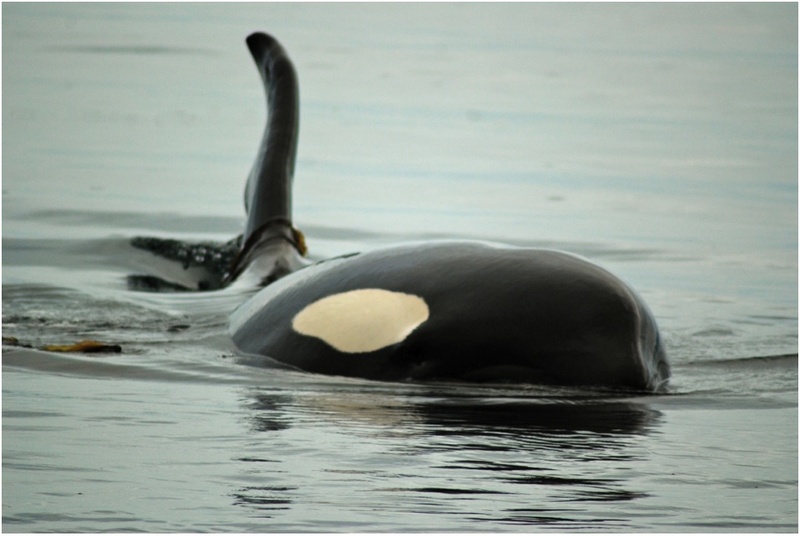 The Endangered southern resident killer whales and potentially, blue whales and sei whales. In fact, bitumen transport would take place through what has been acknowledged by government to be critical habitat for humpback whales, and what is candidate critical habitat for northern resident killer whales and fin whales. The marine mammals, to varying degrees, have survived culling and whaling but continue to experience the treats of reduced prey availability, bioaccumulation of toxins, ocean acidification and further impacts of climate change, noise, vessel strike, entanglement, and more. The anthropogenic impacts on these species’ survival would indisputably be amplified further by this Project due to chronic noise and increased risk of ship strike. As a humpback researcher, I can attest to how oblivious this species can be to boats. I have watched them surface directly in front of motorized vessels after previously having been 400 plus meters away. When one considers the size of the tankers, how narrow the inlets are, the difficulty in adjusting the course of these large vessels, the density of humpback whales, and the potential weather conditions – vessel strike of humpbacks is a very real risk and one that cannot be mitigated by the presence of marine mammal observers. The humpbacks are going to be there. Then what? Outside of concerns about the noise and further traffic impacts to the marine life, and what this means to their survival, the potential losses that would result from a spill are simply the stuff of nightmares. When something goes wrong – then what? It is my understanding that, at best, when there is a spill there would be 15% recovery. And we can’t hope for “at best” – seen Enbridge’s performance record; the likely wind and wave action that would be associated with a spill; that the federal government is closing B.C.’s command centre for emergency oil spills and centralizing operations in . . . Quebec; and that the closure of a Coast Guard base and three marine communication centres in B.C. will leave only two marine communication centres to monitor B.C.’s 27,000 kilometres of coastline. And after the spill, with irreversible and catastrophic loses, what mechanism is there to hold industry accountable? What is there when, concurrent with the review of a Project such as this with the potential for devastating impacts, the government is atrophying or removing the checks and balances the would allow appropriate assessment of risk? The latest Harper statement is that science, not politics, will drive decision making around such projects. How? Environmental governmental organizations are more overwhelmed than ever as a result of these many attacks against science and the environment in addition to now struggling under the needless scrutiny and vilification by our federal government. That therefore, transport of bitumen crude cannot take place along B.C.’s fragile and extraordinary coast and the Enbridge Project must not be approved. Simply, we should be capitalizing on this being Super Natural British Columbia, not Super Tanker British Columbia. sob! Thank you Jackie, so well said and heartfelt.. and true! Let’s hope they listen to the voices in the wild. Inspirational! Amazing words – thank you so much Jackie for standing up for our beautiful coast. I plan to share this with many in the hopes that it moves them to speak their mind as eloquently as you!! Thank you so much Nicole. I can only imagine the power and expertise that will be evident in YOUR oral statement! good job Jackie and of course I knew that your statement would be well said and powerful. Thank you North Vancouver Island! Your testimony, of course, made me bark out in laughter and well up with tears Ms. 26655. Oh the flare and eloquence! The atmosphere is respectful. You are not questioned and you will be surrounded with people who feel as you do. It will be an empowering and hopeful experience – truly. Well spoken. Thank you for posting this. Thank you Darren. Means a great deal. Thank you SO MUCH Jim. I am rather in awe that the statements have been posted already. They were all so powerful. Thank you for the wisdom and heartfelt communication of scientific information. I do believe the whales hold the key to lockout those who look for shorter financial gain over care for our environment. We cannot continue to take from mother earth without protecting the life that sustains ours. We must protect our home and native land as our national anthems states. Very powerful to me to get this feedback and insight from you. I have such great respect and appreciation for your work. Jackie, just wanted to add my voice of support and appreciation of your well researched and documented facts which you were able to present at the hearing. So appreciate the feedback Angela!! Jackie, I have been recently elected by the BC members of the Green Party of Canada to represent them on our Federal Council. I have forwarded your latest video – “if you cant see the bottom” to all members of our Council and Staff. You have a direct line to the advancing Green Wave! Fantastic!!!! Thanks so much for having done that John and for ensuring that there is an advancing Green Wave! Thanks Mr. Cooley. Makes me smile to get this feedback from my past Physics teacher and to know too how dedicated you are to the welfare of wild salmon. Please read Elizabeth May’s testimony to the NEB Hearing on the Northern Gateway Pipeline Application. I have the full text and would be happy to email it to you directly. Hey Jackie thank you for coming to our school and I took out that basking shark book and going to get it in a week or two um I am now I think following you on your web site thanks again you are the school and my hero and I will keep sending and posting more comments and I go on your web site all the time Thanks.!!!! Wonderful Anna! It was so good to see you all again and you, you’ve just made my day! I am so happy to share this information with such a caring, empowered, amazing student!